A Pontic Greek musician accompanying his dancing friends on a lyra. The lyra of the Greeks of Pontos (Black Sea region of Asia Minor) is also known as the Kementse. 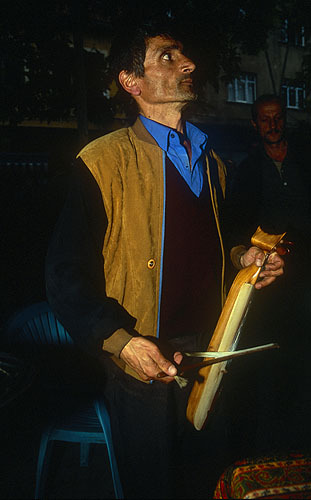 It is played like a violin with a primitive style bow, but the musicians hold the lyra in an upright position. Sometimes they rest the instrument on their knee when they are sitting, and sometimes it is held out in front of them. They sometimes even dance in front of the dancers while holding the lyra in that way. The lyra usually has three strings.